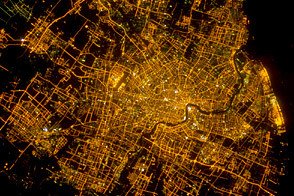 This oblique photograph, taken by an astronaut from the International Space Station, shows the city of Bangkok illuminated by city lights. As the capital and largest city in Thailand, Bangkok is home to more than 9 million people. 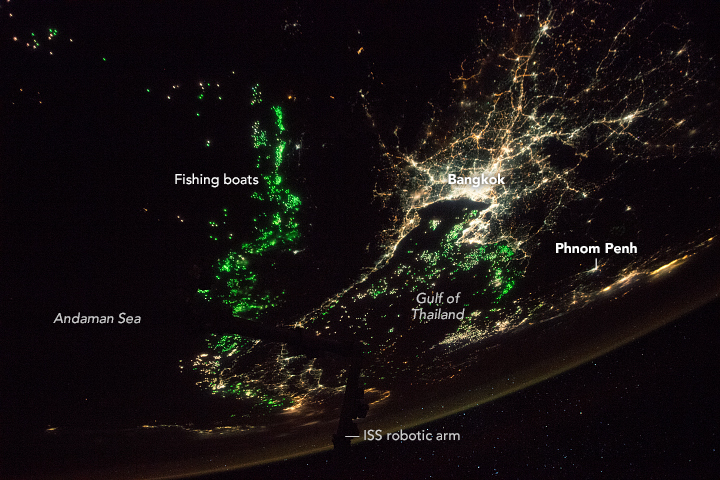 The adjacent waters of the Andaman Sea and Gulf of Thailand are illuminated by hundreds of green lights on fishing boats. 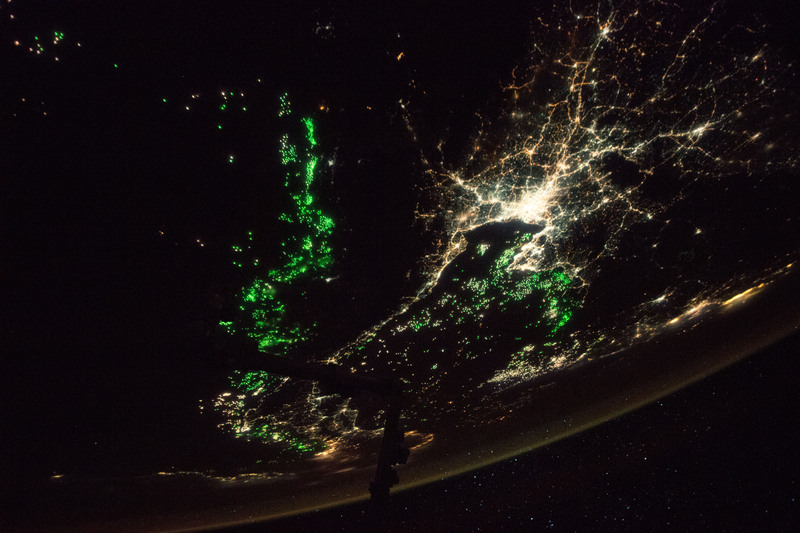 Fishermen use the lights to attract plankton and fish, the preferred diet of commercially important squid. As the bait swims to the surface, the squid follow to feed and get caught by fishermen. The same fishing practices are used off the Atlantic coast of South America. 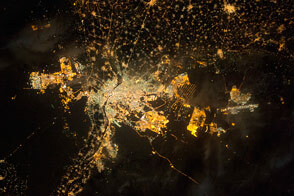 In the photo, the border between Thailand and neighboring Cambodia to the east is distinguished by a marked difference in the number of city lights. Cambodia has less urbanized area and its population is smaller than that of neighboring countries. The majority of Cambodia’s population lives in rural farming areas where electricity is sparse. Phnom Penh is the capital and largest city in Cambodia, with a population of approximately 1.5 million people. Astronaut photograph ISS053-E-451778 was acquired on December 10, 2017, with a Nikon D5 digital camera using a 24 millimeter lens and is provided by the ISS Crew Earth Observations Facility and the Earth Science and Remote Sensing Unit, Johnson Space Center. 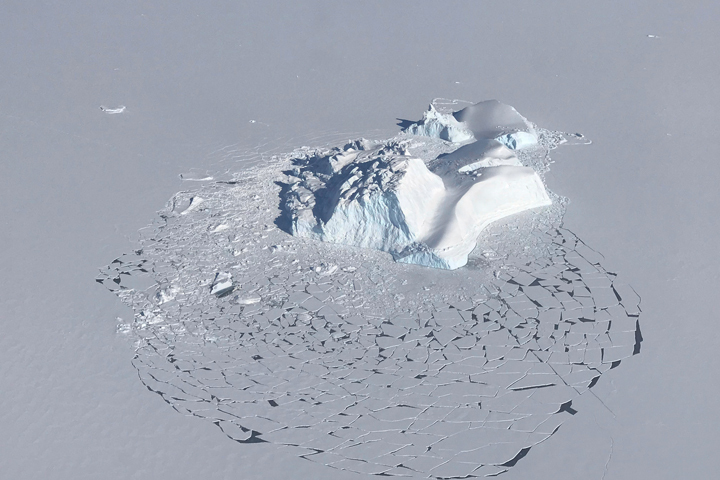 The image was taken by a member of the Expedition 53 crew. The image has been cropped and enhanced to improve contrast, and lens artifacts have been removed. The International Space Station Program supports the laboratory as part of the ISS National Lab to help astronauts take pictures of Earth that will be of the greatest value to scientists and the public, and to make those images freely available on the Internet. Additional images taken by astronauts and cosmonauts can be viewed at the NASA/JSC Gateway to Astronaut Photography of Earth. Caption by Andi Hollier, Hx5, JETS Contract at NASA-JSC. Thailand and Cambodia have distinctly different hues at night compared to nearby seas.